I hope that you will all give a warm welcome to the latest issue of Alphabet Glue! Volume Eight is a celebration of the simplest forms of bookmaking and paper craft, of end of the season gardening and knowing your own backyard. In this issue you'll find inspiration for getting the very most out the remaining days of summer as well as activities that are just as well suited for the welcoming of fall. Read and write comic books with handy templates to help you get started. Craft a field guide to your own backyard and make it rain indoors. Spin paper pinwheels that build stories, make lists of things to learn about, start a seed library and cultivate dreams of next year's garden now. Volume Eight of Alphabet Glue is all about simple projects that celebrate the warm weather while it lasts, while still offering a back-up plan for those early days of fall when the weather drives you inside and you need a little something to do. And, this issue is nicely outfitted with four brand new booklists containing over eighty great titles to stuff your bookbag with during late summer library trips. So whether you'd like to render the comic adventures of friends and family in charcoal and ink, or would rather get to know your backyard trees by name, there is something for everyone in this issue of Alphabet Glue. From science to storytelling, there is plenty of good book inspired fun to be had before we send summer on its way. Let's begin, shall we? Volume Eight of Alphabet Glue is available as a PDF download for $4 USD. Volumes One through Seven are also still available for download for $4 USD each. Click the buttons below to purchase one or more issues of the magazine. 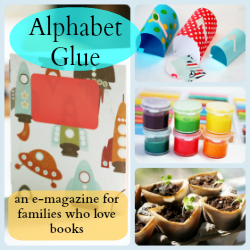 You can also purchase the entire Alphabet Glue library in two sets of four volumes each. Volumes One through Four and Volumes Five through Eight are both available as single PDF files for a discounted price of $15.00 each. To learn more about past issues of Alphabet Glue, you can visit the Alphabet Glue page here.